History of Utah, 1540-1886: Chapter XIII. Settlement and Occupation of the Country. 1847-1852. Founding of Centreville—Bountiful—Ogden—Lynne—Easton—Marriotsville—San Pete—Provo—Indian War—Walled Cities—Evansville—Lehi—Battle Creek—Pleasant Grove—American Fork—Payson—Nephi—Manti—Chief Walker—Fillmore—Site Chosen for the Capital—Tooele—Grantsville—Kaysville—Little Salt Lake—Parowan—Cedar City—Paragoonah—Forts Walker and Harmony—Box Elder Creek—Brigham City—Willard City—San Bernardino in California. SETTLEMENTS AT THE END OF 1852.
surveyed in the autumn of 1849, and the place was named Centreville. In 1848 Isaac Morley and two hundred others settled in the southern part of the valley of the San Pete 9—particulars to be mentioned hereafter. this settlement was given the name of Fort Utah. Within the space enclosed by the stockade was a mound, the top of which was levelled, and on a platform bulk thereon were mounted several twelve-pounders for the purpose of intimidating the Indians. But the Indians were not to be thus intimidated. In the autumn they began to steal the grain and cattle of the white men, and one of their number being killed while in the act of pilfering, hostilities broke out and the fort was soon in a state of siege. Indeed, ill feeling on the part of the Indians had begun to show itself the previous year. Vasquez and Bridger wrote to Brigham on the 17th of April, 1849, that the Utes were badly disposed toward Americans, and that chiefs Elk and Walker were urging the Utes to attack the settlements in Utah Valley. The brethren were advised to protect themselves, but if the Indians were friendly, to teach them to raise grain, and "order them to quit stealing." Brigham was persuaded that Bridger was his enemy, and expressed the conviction that he and the other mountaineers were responsible for all the Indian trouble, and that he was watching every movement of the Mormons and reporting to Thomas H. Benton at Washington. 11 Alexander Williams and D. B. Huntington were empowered by the council to trade exclusively with the Indians on behalf of the community. [paragraph continues] The Indians were attacked on the 8th, and took refuge in a log house, whence they were dislodged next day, and driven into the thicket along the Provo River. In this encounter Joseph Higbee was killed, and Alexander Williams, Samuel Kearns, Albert Miles, Jabez Nowland, and two men named Orr and Stevens were wounded. During the expedition twenty-seven warriors were killed. The women and children threw themselves upon the settlers for protection and support, and were fed and cared for in Salt Lake City until spring. Thus Utah Valley was entirely rid of hostile Indians. Until 1852 there was no further trouble with them of a serious nature; 12 and thus ended the first Indian war of Utah, which like all the others was rather a tame affair. It was the mission of the Mormons to convert the Indians, who were their brethren, and not to kill them. On Dry Creek, near the head of Lake Utah and about sixteen miles northwest of Provo, a settlement was formed in 1851, named Evansville. 17 The neighboring lands were surveyed in lots of forty acres, and to each new settler as he arrived was given a plat of this size until the tract was exhausted. The soil was rich; but here, as elsewhere in the northern part of Utah county, water was scarce. A supply was obtained by diverting a portion of the waters of American Fork creek, 18 and thereafter the affairs of the settlement prospered so rapidly that, in February 1852, the place was incorporated under the name of Lehi, or as it is sometimes written, Lehigh. In the neighborhood of Pleasant Grove were good farming land, good range for stock, and water-power, inducements which quickly attracted emigrants, and caused the place to thrive rapidly. In 1853 the present site was laid out, 20 and to this spot were transferred, on July 24th of that year, the effects of the community, then numbering seventy-five families. On Chalk Creek, in Pahvan Valley, south-west of Manti and about a hundred and fifty miles from Salt Lake City, a site was chosen by Brigham, in October 1851, for the capital of the territory, and named Fillmore, in honor of the president. 28 During 1852 the foundations of the state-house were laid, and many private buildings erected, the settlement numbering about seventy families at the close of the year. of cedar at hand. At the Sevier River they met Charles Shumway, James Allred, and Elijah Ward; also Walker, the Utah war chief, and his people, many of whom were sick with the measles. They proceeded to explore the country for some distance round. On the 1st of January, 1850, they were on Virgen River, whence they passed up the Santa Clara, and came to "the valley subsequently named Mountain Meadows." One division of the party explored Little Salt Lake. Beaver Creek was pronounced an excellent place for a settlement. In a half-frozen condition they reached Provo the 30th, and next day some of them were in Salt Lake. poorest, but near by were a few spots of meadow and farm land, on which, with irrigation, a fair crop could be raised. A number of emigrants, principally Welsh and Scandinavian, joined the party, and two years later a new site was surveyed 42 under the direction of Lorenzo Snow. To the town then laid out was afterward given the name of Brigham City. On Red Creek, about twenty miles north of Cedar City, a small settlement was formed in the autumn of 1852, named Paragoonah, the Pi-Ede name for Little Salt Lake. 44 Six miles south of Cedar City, Fort Walker was built, containing at the close of 1851 only nine men capable of bearing arms; and on Ash Creek, nineteen miles farther south, was Fort Harmony, the southernmost point in the valley occupied by white men, 45 and where John D. Lee located a rancho in 1852. 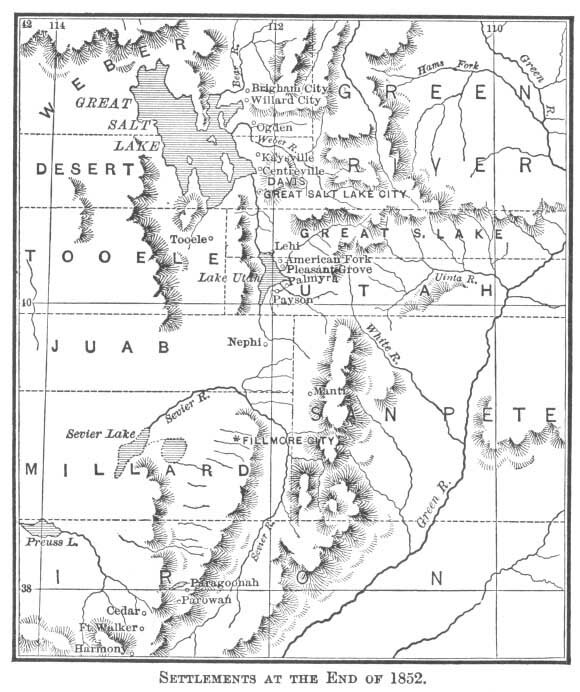 Thus we see that within less than two years after the founding of Salt Lake City, the population there had become larger than could be supported in comfort on the city lots and the lands in their vicinity, and it had been found necessary to form new settlements toward the north and south, the latter part of the territory being preferred, as water, pasture, and land fit for tillage were more abundant. Instead of merely adding suburb to suburb, all clustering around the parent centre, as might have been done by other communities, the church dignitaries, while yet Salt Lake City was but a village, ordered parties of the brethren, some of them still barely rested from their toilsome journey across the plains, to start afresh for remote and unprotected portions of a then unknown country. As new locations were needed, exploring parties were sent forth, and when a site was selected, a small company, usually of volunteers, was placed in charge of an elder and ordered to make ready the proposed settlement. Care was taken that the various crafts should be represented in due proportion, and that the expedition should be well supplied with provisions, implements, and live-stock. of ammunition. 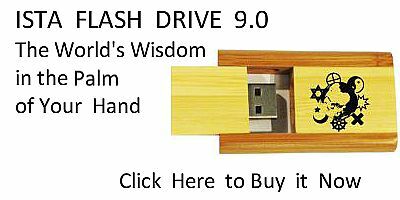 Among them there should be five carpenters and joiners, a millwright, a surveyor, and two blacksmiths, shoemakers, and masons. Thus equipped and selected, the settlers, with their marvellous energy and thrift, made more progress and suffered less privation in reclaiming the waste lands of their wilderness than did the Spaniards in the garden spots of Mexico and Central America, or the English in the most favored regions near the Atlantic seaboard. 306:1 After this incident the water in the creek began to fail, thus for a time preventing the growth of the settlement. In 1880 there was a good flow of water, sufficient for the wants of forty families, with their orchards, gardens, and farm lands. N. T. Porter, in Utah Sketches, MS., 177. 307:2 A little to the south of Centreville was a small settlement which at first went by the name of Call's settlement, afterward taking the name Bountiful. Utah Early Records, MS., 132. In Sloan's Utah Gazetteer, 130-1, it is stated that there were three settlements of this name—East, West, and South Bountiful—West Bountiful being settled in 1848 by James Fackrell and his family, South Bountiful by George Meeyers and Edwin Page. All are now on the line of the Utah Central railroad. In January of this year Sessions also founded a settlement which bore his name, about 15 miles north of S. L. City. Harrison's Crit. Notes on Utah, MS., 45. 307:3 The tract is described as commencing at the mouth of Weber Cañon, following the base of the mountains north to the hot springs, thence westward to the Great Salt Lake, along the southern shore of the lake to a point opposite Weber Cañon, and thence to the point of beginning. Stanford's Ogden City, MS., l; Richards’ Narr., MS., passim. 307:4 Some say for $1,950; others place the amount at $3,000. See Richards’ Narr., MS.; Stanford's Ogden City, MS.
307:5 Utah Early Records, MS., 112. See also S. L. C. Contributor, ii. 240; and Deseret News, Sept. 7, 1850. Stanford's Ogden City, MS., 1-2. The site was selected as early as Sept. 1849, on the south side of the Ogden River, at the point of bench-land between the forks of the Ogden and Weber rivers, so that water from both streams might be used for irrigation. Utah Early Records, MS., 94. North Ogden, formerly called Ogden Hole, once the resort of a noted desperado, was laid out in 1851. Amos Maycock, in Utah Sketches, MS., 114. 'Heber C. Kimball, Willard Richards, J. M. Grant, Brigham Young, and several others ascended a sand hill, Sept. 3d, to discover the best location for a town, which we finally decided should be on the south side of p. 308 Ogden…A dance was instituted in the evening.' Hist. B. Young, MS., 1849, 124. 308:6 Raised by taxation. Stanford's Ogden City, MS., 4. 308:7 Of which Lorin Farr was appointed president, and R. Dana and David B. Dillie councillors. Id., 3. 308:8 The first municipal election was held on Oct. 23d, Farr being chosen mayor, Gilbert Belnap marshal, David Moore recorder, and William Critchellow justice of the peace. Four aldermen and twelve councillors were also elected. Id., 4. According to the statement of John Brown, a resident of Ogden in 1884, there were 100 families in Ogden in 1852. Brown, a native of Yorkshire, England, came to Winter Quarters in 1849, remained in the church for 21 years, and was then cut off at his own request. In 1883 he was the proprietor of the hotel which bears his name. Two miles north of Ogden a settlement named Lynne was formed in 1849. Stanford's Weber Co., MS., 1. Near Lynne a few families formed a settlement named Slaterville in 1852-3, but on account of troubles with Indians, moved into Lynne in 1854. Id., 3. Eight miles south-east of Ogden, at the month of Weber Cañon, on the line of the railway, a small settlement named Easton was formed in 1852, a branch of the church organized, and A. Wadsworth appointed bishop. Three miles northwest of Ogden a settlement named Marriotsville was formed in 1850 by three families. The neighborhood was infested with wolves and bears, and near by were the lodges of 200 Indian warriors. Id., 10. 308:9 So called from the name of an Indian chief. Richards’ Narr., MS., 66. 308:10 Under the leadership of John and Isaac Higbee and Jefferson Hunt of the battalion. Albert Jones, in Utah Sketches, MS., 54. 309:11 'I believe that old Bridger is death on us, and if he knew that 400,000 Indians were coming against us, and any man were to let us know, he would cut his throat…His letter is all bubble and froth…Vasquez is a different sort of man.' Hist. B. Young, MS., 1849, 77. 310:12 'I was ordered not to leave that valley until every Indian was out of it.' Wells’ Narr., MS., 45-6. 310:13 At a general conference of the church, held in October 1849, it was ordered that a city be laid out in the Utah Valley, and called Provo. Utah Early Records, MS., 97. 310:14 A heavy growth of cotton-wood and box-elder covered the river bottom, with a large belt of cedar extending some four miles north from the river and about half a mile in width. Bunch-grass was very plentiful. Albert Jones, in Utah Sketches, MS., 55. 311:15 Deseret News, Jan. 24, 1852. Ross R. Rogers built the first adobe house in 1851. Albert Jones, in Utah Sketches, MS., 53. A large building was erected in 1852 for George A. Smith, the prophet's cousin, then president of Utah co. stake. It was afterward used as a school-house and known as the seminary. In 1851 an adobe wall was commenced, 14 feet in height and four feet at the base. Three sides of it, with bastions, port-holes, and gates, were completed in 1855, the finished length being then two and a half miles. A portion of this wall remained in 1880. Id., 57. These walls were built about several of the settlements. 'It was usual for our people to protect themselves by building what we call a fort—a place the people could get into in the event of a raid. Our wall was a kind of concrete. In Mount Pleasant their walls were built of cobble rock, parts of which are now standing. At that place they put a grist-mill inside, so the Indians couldn't cut them off. At Nephi the Indians did cut them off from their grist-mill.' Wells’ Narr., MS., 60. 311:16 Letter in Deseret News, Feb. 21, 1852. 311:17 A few houses were built on an adjacent site by David Savage and others in 1850. David Evans, in Utah Sketches, MS., 37. 311:18 By a ditch seven miles in length. 312:19 Hist. B. Young, MS., 1849, 24-5; John Brown, in Utah Sketches, MS., 30. The first Indian trouble was a little skirmish between some sheep-herders and Indians. Wells’ Narr., MS., 43. 312:20 By George A. Smith and Ezra T. Benson. 312:21 The site was laid out by George A. Smith, assisted by L. E. Harrington, Arza Adams, Stephen Chipman, William Greenwood, and Stephen Mott. A. J. Stewart was the surveyor. The first house was built by Adams and Chipman in 1850; the first grist-mill by Adams in 1851; and the first store was opened by Thomas McKenzie in the same year. L. E. Harrington, in Utah Sketches, MS., 121. 312:22 The first settlers were James Pace, Andrew Jackson Stewart, and John C. Searle, Joseph S. Tanner, in Utah Sketches, MS., 3. 313:23 Its length was 420 rods, and its cost $8,400. Portions of it remained in 1880. Geo. Teasdale, in Id., 111. 313:24 The first settler was Timothy B. Foote, who, with his wife and six children, took up his abode in this neighborhood in the autumn of 1851. Before the end of the year he was joined by seven other families. Id., 107; and before the end of 1852, 35 additional families settled at Nephi. Deseret News, Dec. 11, 1852. 313:25 'Walker was the chief of the Ute Indians…Uinta was the great chief of this region, and Ora was the head chief of the Ute nation…Walker's headquarters were the Sevier, generally; he would pay a visit to San Pete once a year.' Wells’ Narr., MS., 48, 56. 'Walker used to go into California to steal horses; had a place of concealment among the mountains. At one time, while there, people were so incensed that they turned out to capture him and his band. In the dead of night be quietly took possession of their horses and trappings and came into Utah triumphant. He would boast of his proceedings some time later. He never brought stolen goods into the settlements, but secreted them among his people.' Utah Notes, MS., 8. 314:26 Including 110 blocks, each 26 rods square, with eight lots to each block. Utah Early Records, MS., 111. The site was surveyed by Jesse W. Fox, under Brigham's direction. J. B. Maiben, in Utah Sketches, MS., 172. 314:27 In June 1852 a fort was completed, the walls being eight feet high and two feet thick. Deseret News, July 10, 1852. 314:29 Now called the Oquirrh Mountains, Oquirrh being probably an Indian word. 315:30 The site was surveyed by Jesse W. Fox, under Rowberry's direction. The first house was built by Tolman, who in partnership with Rowberry erected a saw-mill nine miles north of the settlement. The first grist-mill was built by Ezaias Edwards, and the first store opened by Isaac Lee. John Rowberry and F. M. Lyman, in Utah Sketches, MS., 150. A meeting-house 24 feet square had been finished in March 1852. Deseret News, April 17, 1852. Twelve miles to the west of Tooele was a small settlement named Grantsville. 315:31 From 5 bushels of club-wheat, planted during this year, 250 bushels were raised. Edward Phillips, in Utah Sketches, 81-2. 315:32 A mile and a half south of Sandy Creek was a herd-house, the property of S. O. Holmes. Near this spot a fort was built, surrounded with a mud wall. 316:33 John Urie, in Utah Sketches, MS., 88, says that there were 119 men and 48 women and children, with 101 wagons, 368 oxen, 146 cows, and about 22 tons of seed; that they were well supplied with implements, and had 300 lbs of flour per capita. Richards, in Utah Early Records, MS., 117, mentions 163 souls, of whom 30 were women. 316:34 James G. Bleak, in Utah Sketches, MS., 67-8. On the south-east corner of the fort a meeting-house in the shape of a St Andrew's cross was built of hewn logs. Utah Early Records, MS., 163. The name was first spelt Paroan. Frontier Guardian, Aug. 8, 1851. A view of the fort, with Little Salt Lake in the distance, painted by W. Majors, was presented by Brigham Young to the Deseret University in 1870. Contributor, ii. 270. 316:35 In the Deseret News of March 6, 1852, is an account of the pioneer anniversary celebrated at Parowan on July 24, 1851. 317:36 Hist. B. Young, MS., 1851, 46. On the same page is mentioned the first use in the country of the stone-coal at Parowan, used in blacksmith work. 317:37 George A. Smith, in Frontier Guardian, Aug. 8, 1851, and in Deseret News, Dec. 11, 1852. 317:38 This valley had been explored as early as 1847. In December of that year, a party of the pioneers passed through it, as already mentioned, on their way to California to purchase live-stock and provisions. 317:39 Building progressed rapidly, and during the following summer one Burr Frost, a blacksmith from Parowan, started the manufacture of iron, making nails enough to shoe a horse. Deseret News, Nov. 27, 1852. 317:40 John Urie, in Utah Sketches, MS., 93-4. See also Deseret News, July 24, 1852. The scarcity of nails hindered building. Workmen were brought from England to manufacture them from native ore, but the experiment failed; as the work could not be done on a sufficiently large scale to make it profitable, and it was abandoned. Years later, when the soldiers were ordered away from Camp Floyd, the settlers bought old iron cheap, and nails were manufactured to advantage. The price in market then was 30 or 40 cts a lb. ; afterward the railroad brought them in and they were sold at 3 to 5 cents a pound. 317:41 About 60 miles north of Salt Lake City. A. Christensen, in Utah Sketches, MS., 102. 318:42 In blocks of six acres, each lot being half an acre. 318:43 The first settlers on the old site were Jonathan S. Wells, who built the first house, and was the first to commence farming, Elisha Mallory, who with his brother Lemuel built the first grist-mill, M. McCreary, Alfred Walton, and Lyman B. Wells. George W. Ward, in Utah Sketches, MS., 44-5. The city was named after Willard Richards. Richards’ Narr., MS., 67. 318:44 In December, 15 or 20 families had settled there. Deseret News, Dec. 11, 1852. On June 12, 1851, a company with a few wagons started for this point from Salt Lake City, Utah Early Records, MS., 128. 318:45 This settlement was 20 miles north of the Rio Virgen. It was thought that the route to California might be shortened by way of the fort about 35 miles. Deseret News, Dec. 11, 1852. In addition to those mentioned in the text, a number of small settlements had been made in various parts of the territory. Farmington, now the county seat of Davis co., and on the line of the Utah Central railroad, was first settled in 1848 by D. A. Miller and four others. In 1849 it was organized as a ward. Mill Creek, in S. Lake co., was settled in 1848-9 by John Neff and nine others; Alpine City and Springville, in Utah co., in 1850, the former by Isaac Houston with ten others, the latter by A. Johnson and three comrades. Santaquin, in the same county, was settled in 1852; abandoned in 1853 on account of Indian raids, and reoccupied in 1856 by B. F. Johnson and 23 associates. The site of Harrisville, a few miles north of Ogden, was occupied in the spring of 1850 by Ivin Stewart, abandoned the same autumn on account of an Indian outbreak, and resettled in 1851 by P. G. Taylor and others· In 1883 Taylor was bishop of this ward. Slaterville, in Weber county, was first settled in the fall of 1850 by Alex. Kelley, who was soon afterward joined by several families; in 1853—the year of the Walker war—it was abandoned, the inhabitants taking refuge in Bingham Fort, but was again occupied in 1854. South Weber, in the same county, p. 319 was located in 1851 by Robt Watts and nine others. Uintah, at the mouth of Weber Cañon, was settled in 1850 by Dan. Smith and a few others. It was first called East Weber, and received its present name on the 4th of March, 1867, at which date the Union Pacific railroad was finished to this point. Sloan's Utah Gazetteer, 1884, passim. Of the above settlements, those which became prominent will be mentioned later. 319:46 The party must also have 17 sets of drag teeth, and of grain and grass scythes, sickles, and pitchforks, 50 each. 320:47 In Hist. B. Young, MS., 1851, 85, it is stated that, at the next session of congress, it was expected that a mail route would be established to San Diego by way of Parowan. At this date there was, as we shall see later, a monthly mail between S. L. City and Independence, Mo. There was also a mail to Sacramento, leaving that and S. L. City on the 1st of each month, a bi-monthly mail to The Dalles, Or., a weekly mail to the San Pete valley, and a semi-weekly mail to Brownsville. 320:48 Hist. B. Young, MS., 1851, 14. The object of the establishment of this colony was that the people gathering to Utah from the Islands, and even Europe, might have an outfitting post. In 1853, Keokuk, Iowa, on the Mississippi River, was selected by the western-bound emigrants as a rendezvous and place of outfitting. Next: Chapter XIV. Education, Manufactures, Commerce, Agriculture, Society. 1850-1852.